“You cannot choose a destiny if you’re dead,”(Kindle Location 250). She’s a down to earth, call me Addy not Adalaide, potty-mouth who works in an antiques shop in Seattle instead of going to law school like her mother wants. What is she doing in life before getting stuck in the middle of a battle between Angels and Demons and all that lies in between? Not much. 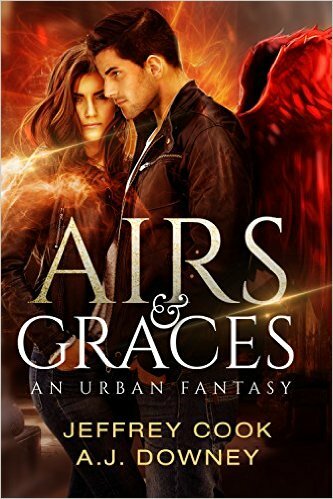 Not as much as she will be doing when Tabbris, the Archangel protects her as she tries to unlock the Grace that the antiques shop owner Piorre stuck inside of her. Addy, at least at first, has a boring and very average personality. We don’t even know who she is before she’s whisked into this otherworld battle. How can we sympathize with her and her plight when we don’t even know who she is? Her background is only revealed in the latter half of the book. Tabbris also seems quite average and not very extraordinary, aside from being an Archangel and having wings and such. These two main characters seem secondary to the political-action plotline war and I feel like not much was gained with the POV changes from Tabbris to Addy. This book contains large chunks of exposition and dialogue explaining what is going on and defining the world and the political background of the war. Most of the tension and buildup is the world-building and background information on the war going on with Earth and Addy in the middle. This novel was published through CreateSpace Independent Publishing Platform on July 19th, 2015 and is available on Amazon here.